The Myers headquarters at Victoria Harbour in the Docklands has been listed for sale with expectations that the A-grade commercial office building could fetch $270 million. Built in 2010, 800 Collins Street features ground floor retail shops and 10 upper levels of office space with two levels of parking. The Myer building is jointly owned by the Lendlease-managed Australian Prime Property Fund Commercial and Savills Investment Management. The building is fully occupied by tenants including retail giant Myer and Latitude Financial Services (formerly GE Money) who have entered a 10-year lease, providing a diversified tenancy mix and increasing the building’s Weighted Average Lease Expiry (WALE) to approximately six years. JLL Victoria Sales & Investments Directors Langton McHarg and Paul Kempton were appointed to market the asset alongside Savills Australia Capital Transactions Directors Ian Hetherington, Simon Fenn and Ben Azar. “The Melbourne office market is rated by JLL in the top two best performing office destinations in the world making Melbourne office assets very attractive in comparison to other office markets," McHarg said. The building comprises over 28,619 square metres of office space, 873.4 square metres of retail space and total capacity equalling 29,492.6 square metres with expansive floorplates of around 2,900 square metres. The A-Grade, 5 star NABERS rating building is easily accessible by city arterials roads and connected directly to the Melbourne Central Business District, Southern Cross and Flinders Street rail stations. “Currently, vacancy rates are circa one per cent, therefore we expect strong growth going forward. The area remains popular with tenants in the banking, finance and insurance sectors due to the larger floor plates and ‘campus style’ buildings," McHarg said. 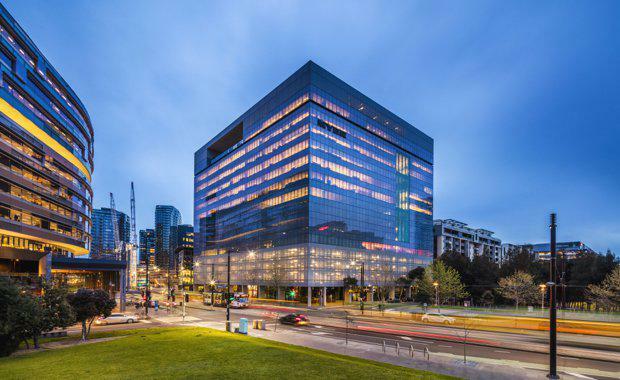 The Property Council of Australia said in July this year that the total amount of office stock recorded in the Melbourne CBD was around 4.5 million square metres. The Docklands precinct has some 19.8 per cent of the total CBD stock. Since its inception in 2004, about 900,000 square metres of office space has been developed in the precinct, which is now home to several of Australia’s leading corporates.